Stolen Saddles: What would you do? Where do they go? I received this email late last night asking for help in recovering stolen saddles…and it got me thinking. How often does this happen? Where do these saddles end up? After reading the post I was even more interested because these particular saddles are trophy saddles which should make them even easier to identify…and I would guess more difficult to hide. Have you ever had tack stolen before? Were you at home? At a show? Traveling? Looking back at the incident was there something you could have done to prevent it? What would you recommend others do? I wondered if a website existed for reporting these crimes. It looks like several have been started but my search didn’t reveal any that have been regularly maintained. I wonder if this is because a different method worked better, maybe Craigslist or the police? 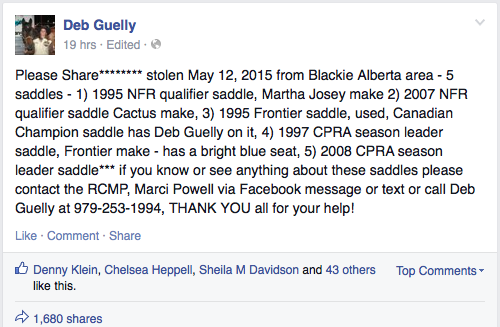 Have you seen these stolen saddles? ← What tests and paperwork did you need when crossing state borders with horses? I had a bob marshall and a basic big horn saddle stolen along with a bunch of othwr stuff…not sure how I am going to replace it…I had no idea how much they were worth until I tried to replace them. I definetly don’t want my home inaurance to cancel or raise rates…I have been so busy this year I cant even pin point when they were taken…very frustrated. Why cant people just get a job?? I had my Steuben saddle stolen out of my garage by my renters.I am wondering how to find out what happened to it. I never keep my tack at a stable…it is locked up tight in our garage. Theft was not tolerated at my old boarding stable and the “thieves” were run out of the barn. My current boarding stable owner is onsite all the time, has surveillance cameras every where and is adding more this summer. He checks the cameras all the time and when he catches a thief, they are immediately asked to vacate the premises or he will file charges. It sure gives me some peace of mind! I have boarded at barns where your tack was stolen. At one barn we knew it was a trainer who came in now and then, but couldn’t prove it. At another barn it turned out to be the main trainer…when anyone announced they were leaving she would steal their tack. I was on to her so when I left, I had another boarder check the trainer’s trucks and sure enough, there was my stuff. After that I got a huge trunk and locked up everything or kept it in the car. I so love having my own barn so none of this stuff happens. many years ago I had a saddle stolen from a tack room at a stable where I was keeping my horse. the person took my saddle a different person’s bridle and an other person’s saddle pad and a fourth person’s brushes. The police said “sorry, but the reality is that they are almost impossible to track and you are not going to get them back.” The think that may have prevented it would have been a lock on the entry gate that each person who had a horse there would have a key to. Or at least a lock on the tack shed that was outside the stable. No one lived on the stable grounds. I hate stables where nobody lives on the grounds…they are an open invitation to theft, whether horses or tack. My sister had her super nice full tack trunk stolen from the barn we boarded at, along with a wintec saddle. Never recovered any of it. House insurance covered it but then insurance cancelled us. We had a billy cook saddle stolen from our barn. It wasn’t one that we used often so we don’t know how long it was missing before we noticed it. We live in a small town in Ohio where often we don’t lock our doors or take keys out of our vehicles and have never had anything stolen before. I was told by a thief (she and her man stole tack for drugs) if you will put a sign up that says “this ________ is under video surveillance and I will prosecute” they would go on to the next place. We also have our drivers license number engraved as well as pictures.